Consultants hired by the town of Princeton presented a proposal for a new historic district at a meeting Monday night at Princeton Town Hall. The consultant’s work was to identify if some area around the Witherspoon-Jackson neighborhood would fit requirements for a legally-defined historic district. After considering the history of the local area, the consultants concluded that a new district could be justified as a ‘distinct neighborhood in Princeton within the context of racial discrimination against its African American residents’. They also argued that the neighborhood has sufficient integrity and character to warrant designation. The boundaries of the proposed district (see also map above) include all the properties between Route 206 and Witherspoon Street, with a northern boundary at Community Park South and a southern boundary around Paul Robeson Place. The building that is home to the Terra Momo bread company would be included. Buildings on both sides of Witherspoon Street itself would be included, but the historic Princeton Cemetery would be exempt, as would the Princeton University accommodation at Merwick-Stanworth. Routine maintenance – replacement of existing exterior fittings with the same type, for example, fixing brickwork or siding, would normally be allowed without an application. Homeowners would only be required to email the HPC to make them aware of the work. ‘Administrative approval’ – For minor changes to the exterior. If a homeowner wanted to replace doors or windows with a different type, for example, they would need to pay a $75 fee, and a site review would take place to ensure the work was appropriate. A full hearing before the commission would not, however, be necessary. Additions – All additions or modifications would require the property owner to make a full application and appear before the Historic Preservation Commission, who would judge whether the work was appropriate and direct what materials could be used. The town hall was full for the presentation. In public comment, the majority of speakers spoke emotionally about their experiences of racism, and argued that historic designation would be a recognition of the contributions of Princeton’s African American residents. A smaller number of speakers questioned the costs associated with compliance with historic designation, and expressed concern about the loss of property rights that would be felt by homeowners. 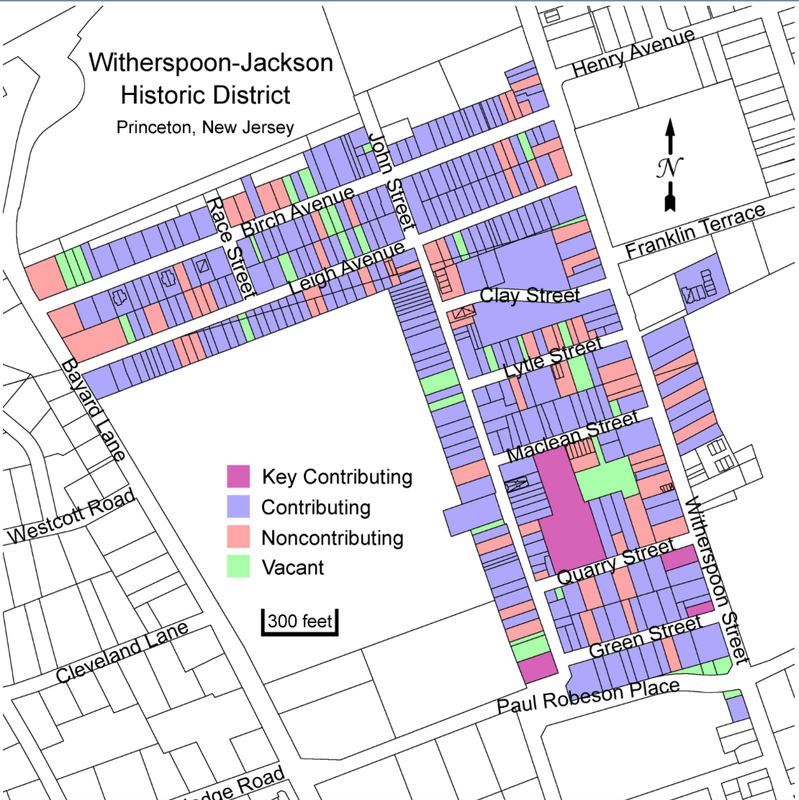 The consultants have set up a website, ‘princetonbuildings.info‘ showing their work and including a database of all the buildings in the proposed historic district. Their full 110-page report is also available at that site (or click here to download it). The measure will now be considered by Princeton Council, either in December or January. Planet Princeton also has a report about the meeting here. This entry was posted in architecture, Princeton, Zoning and tagged historic preservation, history, Princeton. Bookmark the permalink.